Vintage-style octave, but needs thoughtful placement in your chain. Works brilliantly with a distortion pedal. Good build quality and value. Needs to be placed after a buffered stompbox. Unusual among stompboxes, the Octo Puss from West Sussex-based Bigfoot Engineering is passive, requiring neither battery nor adaptor. This restricts where it can be used in an effects chain, because it has to be plugged in after a buffered pedal. 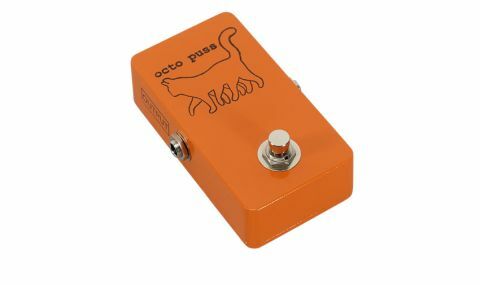 "Inspired by Josh Homme, the Octo Puss is designed to deliver an octave up in the style of a vintage octave pedal"
It also means that it has no LED. Inspired by Josh Homme, the Octo Puss is designed to deliver an octave up in the style of a vintage octave pedal, with that character recreated by the use of original germanium diodes and a transformer. Clean, the pedal yields a gritty tone with octave added and you can get a faux sitar sound when playing single notes. But it really comes alive in conjunction with an overdrive, distortion or fuzz pedal or a driven amp, offering an extra dimension to single notes as that octave harmonic comes through, plus a veneer of brightness on chords. If you already have a favourite fuzz, stick one of these in front of it (but after a buffered pedal) for that vintage octave fuzz sound.